AGING: 10% New French Oak, 90% used oak. Aged 7.5 months on own lees. TASTING NOTES: A nose of kirsch, bing cherry and notes of lavender and violet. Bright and juicy on the palate with tart cherry, cola, baking spices and earth. Lingering finish with good acidity. PAIRINGS: Cured meats, pizza, and grilled salmon or portobello. 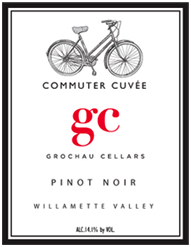 A portion of the proceeds from each bottle of Commuter Cuvée go to the charity, No Kid Hungry.